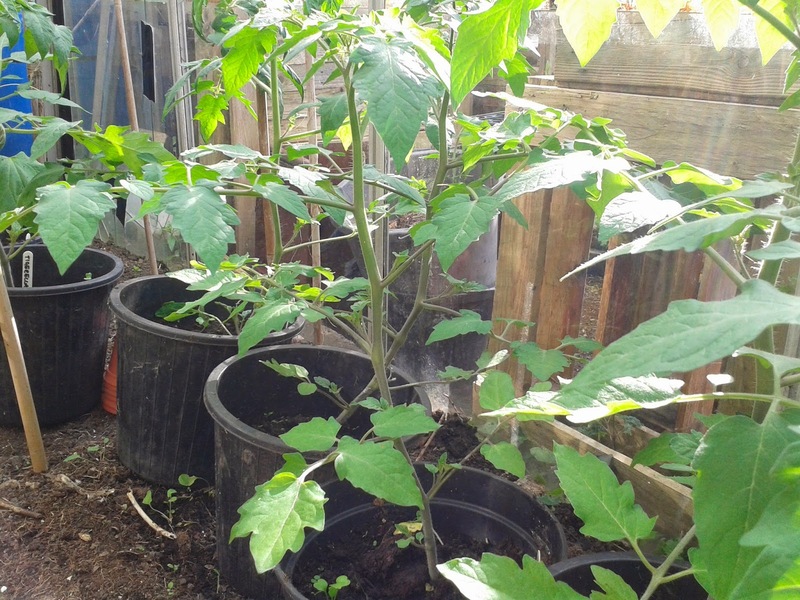 A Blog about Compost: Planting out tomatoes. 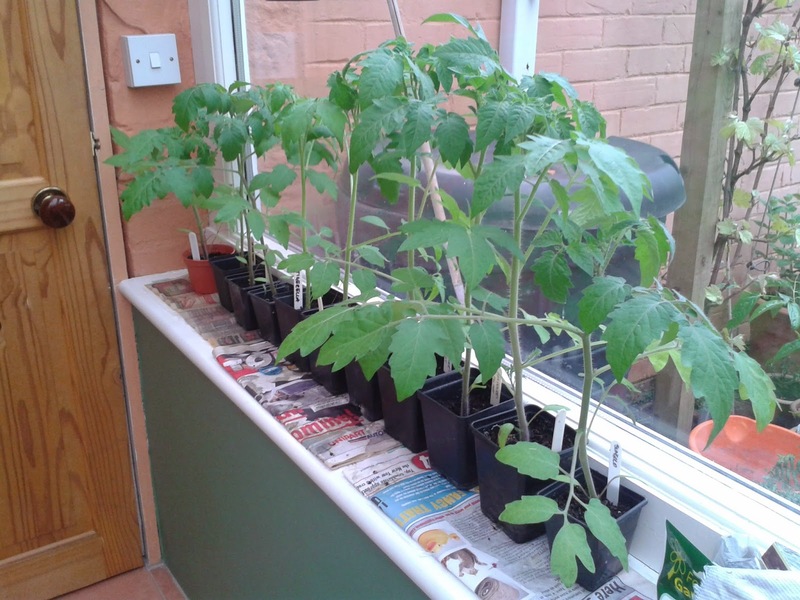 These are my tomato plants growing on a windowsill. Every year I try not to let them get too leggy but take my eye off the ball and there they go. (They are always alright in the end and fruit very well). I've started to plant them out in the greenhouse. 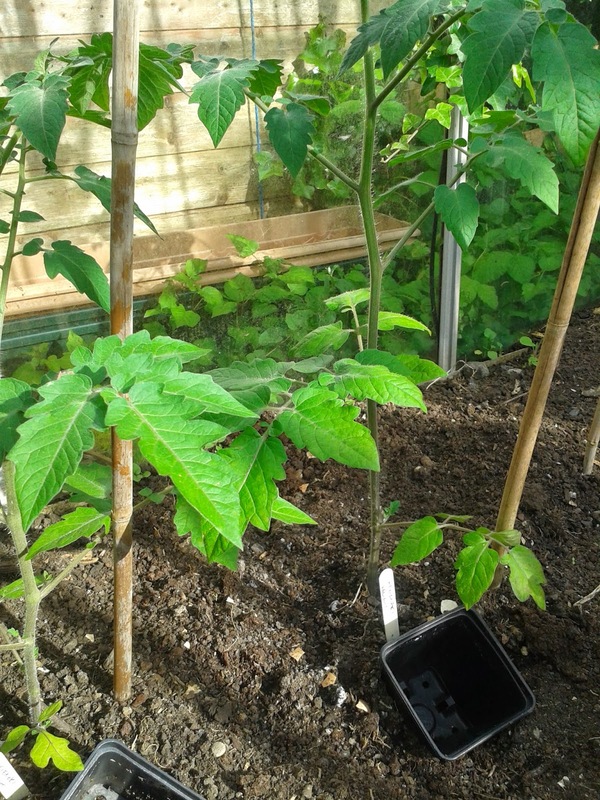 I have soil in the borders of my greenhouse and I know this can carry tomato blight and affect the plants. It's recommended that you dig out the soil and fill with new clean soil. I did do this once but it was such hard work that I have never done it since. 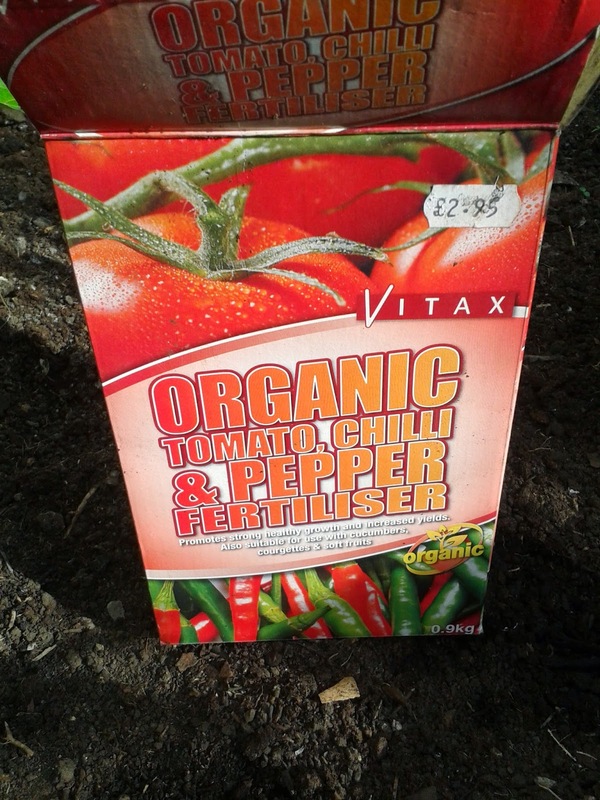 - Direct in the soil - I usually dig out a hole and fill it with compost or soil from a growbag or often a mixture, then I put the plant right at the bottom of the hole so the soil comes up at least to the two seed leaves and backfill with soil/compost. Tomatoes can root right along their stems so if you bury the stems they will produce more roots. Sometimes you can see the white roots forming on the stem. - Last year I tried a different method. I think I saw this used for cucumbers first. I use large pots with the bottoms cut out. These are placed on the soil and filled up with compost so the plants can root into them but also grow out through the bottom. These are the ones in pots(with no bottoms) waiting for their canes. We have a framework for support and each tomato plant gets a cane tied into the top. I sometimes underestimate how heavy these plants are and they fall over. They can grow to about 8 ft if you don't stop them and as long as they keep fruiting, I let them. By the end of the summer I can hardly get into the greenhouse. Both these methods get over the fact of the soil being contaminated. I do get blight but not until September or October and the plants have sometimes fruited in to November. I always get a great crop, and miss the great taste for the rest of the year, so lets hope this year is the same.